So Napoles surrendered. Yes, anyone who doesn’t know this famous and shocking news is not an avid anti-pork barrel Filipino. Everyone’s talking about it now and they are probably sharing the ironic things to be shared regarding the moves made my Napoles. However, stepping aside the common issue, one booming question is: what happens to the 10M? The most intriguing argument to discuss is how will the government justify the unclaimed 10M. 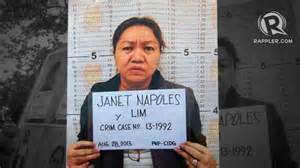 Sources say that right after the Malacañang Palace impost the 10M-guarantee to whoever sees Napoles, the woman eventually surrendered directly to the president, what a move by Janet. Since it was unexpected that she will do such a thing, people are now clamoring for answers about the floating millions. There are funny and serious comments in the internet. – Let the 10M be given thru a raffle promo. Every one who thinks like this is absolutely a person who cares less about the fact that Janet surrendered but puts more attention on how to gain advantage on the large amount of money. LOL. – The government will keep the money. Though there is a serious political and economic sense in it, the funny side is that since PNoy was the one who met Napoles personally then he can be noted as the one who found her. So, does that mean the government is the lucky winner of the 10M? Well, lucky for them and it’s seems like they needed it more than we do unless they make some ghost projects out of it. – Napoles surrenders, she gets the money. Eventually, since no one actually find her hideout then she can have a claim to the prize. However, due to her large debt in the country’s economy, she will then use the money as a partial payment to her payable. Great because it would really be so helpful, and I’m being sarcastic. – Reasons. Some concerned citizens wonder why the government put a large amount of money in exchange for Napoles hideout. Since Napoles surrendered and directly to the president at that, it seems to show that the government is only making a big play to the people on their clever moves and stuffs. In the first place, they should have prepared some plan B if ever she surrenders, which actually is the case right now. – Knock some sense out of it. It is a great opportunity to use the money for public projects. 10M was already a budget for a certain purpose and since the aim was forfeited, wouldn’t it be reasonable enough to simply share it to public by spending the fund for community purposes? – Disclose the issue. Though it’s not as famous as the current issue of Napoles’ surrender, it would be proper to tell the public on the current plans of the government regarding the money intended for Napoles’ hideout. N/A : all of these items were all from social networking sites and doesn’t specifically show the author’s point of view.